Even though you may feel like paying an arm and a leg for a solar attic fan, you may end up realizing it’s one of your best decisions to make. The electricity bill is gonna be so much lower in time which is why the solar attic fan becomes a wise investment any given day. Most houses out there need a solar attic fan ranging from 10 watts to 25 watts. Don’t fall in the trap of thinking that bigger is better, as it’s not the case for a solar attic fan. You may end up with a model that doesn’t truly fits your needs, after all. You need instead a solar attic fan that matches the square footage of your house. To get an idea, a 1200sq.ft. house needs a 10-watt model, whereas a 15-watt fan does a great job for a 1600sq.ft. house. You only need to go for the biggest model (25 watt) if your house is somewhere around 2300sq.ft. Your house is even bigger than that? You may need to shop for more than just one solar attic fanJ. Getting a good solar attic fan isn’t enough and you need to set the right location in order to get the best out of it. You may want to install it in a gable, in front of a previous existing vent or straight on the roof. If your house isn’t very complicated, you may easily install it on your own. Additionally, you don’t really need an electrician to install it but you may play it safe and get a piece of advice from one. Juts to be sure. A good solar attic fan shouldn’t cost more than $800, which is still good when you get to consider the reducing costs by up to75%. A solar attic fan may also protect your roof and other pricey items from too much moisture. Do it all the way when getting a solar attic fan and get a model that includes a thermostat, able to store the energy when it’s cloudy outside. Take some time and check the various models out there in order to decide which one fits your needs the best. 1). Don’t let the small size of the Amtrak Solar Attic Fan fool you. As small as it is, the solar attic fan is quite powerful and manages to handle a good ventilation of your attic. The attic fan comes with a high wattage and includes a strong fan motor that does need a full sunlight in order to work. The 12 V DC fan is especially made to work with a solar panel. The 35-watt high quality solar panel gives enough power to the fan. You may easily install the fan anywhere in your attic or in the gable vent. When it comes to the build, we notice the good quality fan blades that, even though rather small, manage to be efficient. As soon as the sunlight hits the solar panel, the fan turns on, running all day long. It ventilates your house with nice air circulation the whole day. You don’t need to make any holes when installing the attic fan and you don’t have to be the best handy man in town for installing it either. You don’t need any permits, inspections or electricians either. Wiring the fan isn’t difficult either. The solar panel comes with 4 mounting brackets and the instructions are useful. The solar attic fan pushes a lot of air and comes for a great price. It’s built in our USA and is reliable. Despite the minor cons, we still think the solar attic fan is a great choice, especially when shopping on a tight budget. 2). Easy to install and powerful, the Durabuild 527S-DUB-106-BLK Roof Mount Solar Powered Attic Fan is able to increase the comfort in your house as it ventilates the air in your attic. The solar attic fan is big enough to ventilate up to 1850 sq.ft. and its motor is powered by an industrial grade 20-Watt solar panel. As the solar panel features a thermostat, the fan becomes more versatile and dependable. The 24V motor is rather quiet, whereas the solar panel is adjustable for better performance. For instance, if the conditioned space is around 85 degrees, after the motor turned on and lowered the temperature to 65 degrees, it automatically shuts off. The shroud is impact and UV resistant. The shroud and panel are also easy to adjust for best sun exposure. The solar attic fan has a good built and the flashing is galvanized and powder coated in order to resist rust and minimize leaks. The wire mesh protects against rodents and the fan looks good. All in all, for its adjustability, power and quiet operation, the solar attic fan is a choice not to be missed when in need. 3). The Broan 345SOWW Surface Mount Solar Powered Attic Ventilator brings many good things to the table and its easy installation and durability are only some to begin with. 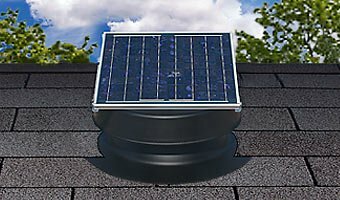 The solar attic fan eliminates heat from your attic during summer, minimizing moisture and ice dams during the winter. You don’t need to use any electricity for it and by cooling your attic you may also expand the lifespan of your roof. The solar attic lowers risk for rot, premature aging and shingle distortion from too much heat. Let’s not forget about the lower energy costs that come along when you install a good solar attic fan. 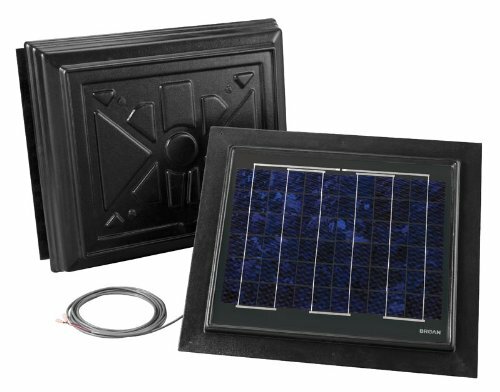 The solar attic fan comes with a 28-watt solar panel that works well and looks good at the same time. The aluminum screen is corrosion-resistant, keeping pests at distance. We also notice the stainless steel fasteners and galvanized steel brackets that sustain the durability of the unit. The small footprint of the solar fan is another good feature, which also means less shingles to cut, easing up the installation. Now that we’re here, we have to mention the dome locator tabs that make installation so much easier, as they ensure stops to locate and seat dome during installation. The solar attic fan is strong and efficiently ventilates a 3,222 cubic ft. attic. You may connect a thermostat if ever in need. The housing presents a molded design with tough, UV-stabilized and color-dyed ABS plastic that handles hail and fading, not losing its nice appearance over time. You can also paint it for a better color match with your roof. 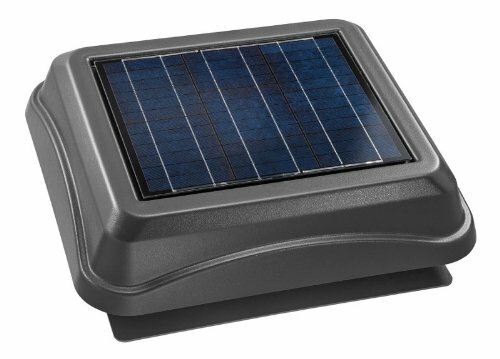 The solar attic fan has a low profile and blends nicely into any roof. The motor is strong and doesn’t need direct sunlight to operate. Long story short, the solar attic fan comes with way too many good things to be left out when shopping. 4). 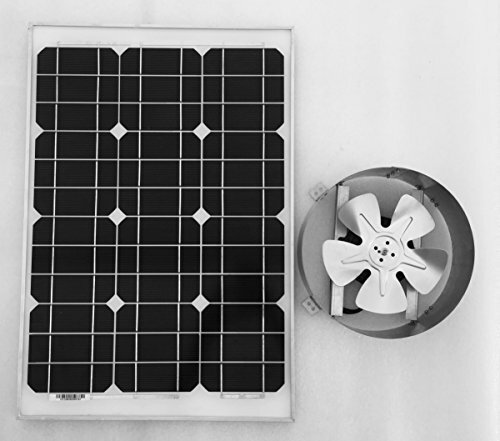 The high quality materials used on the Solar Attic Fan 36-watt don’t explain only its performance, but also its price. The solar attic fan comes with very clear instructions and even though some may want to get a roofing contractor, you may also do it on your own (if you’re the handy type). You may easily mount it on 3/12 to 12/12 pitch roofs. You don’t need any wiring to install the solar fan and the unit comes with all the hardware you need for it. The DC motor on the fan is powered by the included 36-Watt solar panel, managing to cool your entire house throughout the entire day. The solar panel is easy to adjust, going from flat up to 45-degree angle. The solar attic fan is powerful and pushes air up to 1628 cubic ft. per minute. It’s big and strong enough to ventilate a 2625 sq.ft. of attic space. Despite its power, the solar fan is rather quiet even though it comes with metal fan that is typically louder than a plastic type. 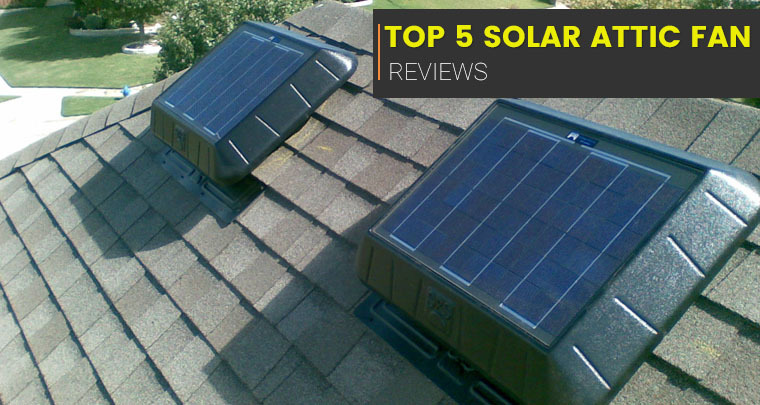 The solar attic fan is high quality and serves you well for quite some time. It lowers your electricity bill over the summer and is a good investment of your money. Regardless the cons, for the high quality materials and reliable performance, the solar attic fan is worth every single penny. 5). You may feel like you’re paying an arm and a leg for the Broan 355RSOBK Remote Mount Solar Powered Attic Ventilator, but once you install it and check your electricity bill (not to mention the increased comfort in your house), you get to realize it was all worth it. The 7/8 inch high profile makes the fan efficient for attics up to 1600 sq.ft. and hurricane rated to 140mph winds. The 20-watt solar panel gets sunlight even in overcast days and it’s weatherproof. It has a good build as it’s made with tempered glass, taking hail and severe weather conditions. The hardened shaft motor has a steel housing and it’s very well balanced, for better performance. The DC motor has variable voltage and comes with sealed ball bearing. It’s very quiet and you don’t feel any vibration when in use either. The solar attic fan has an efficient design that increases airflow, with minimal noise. The heavy gauge, stainless steel bird and rodent screen ensure great protection against insects and other animal, with little to none effect on the air flow. The rugged build makes the solar attic fan long lasting and resistant to delaminating. It’s easy to install it and its low profile, square design ensures stability and minimizes risk for damage from sunlight. It comes with stainless steel brackets, bolt, nuts, and self-taping screws that sustain its durability. Apart from its high price, we have no cons to mention. We like the solar attic fan for its high performance and strong build, which turn it into a wise investment anytime.